Since the Minister of Home Affairs’ statement of 29th December, significant misinformation has been spread regarding the AME Church in Bermuda, St. Paul AME Church and its pastor, Rev. Nicholas Genevieve-Tweed. Much of what has been said has been extremely personal. 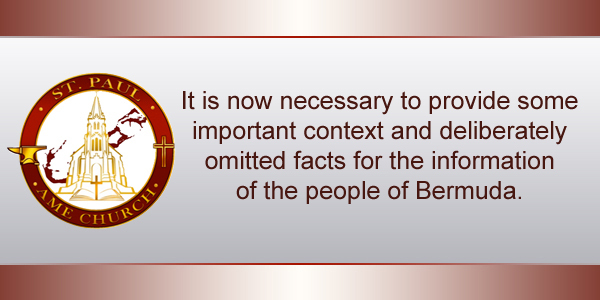 It is now necessary to provide some important context and deliberately omitted facts for the information of the people of Bermuda. 1. The Minister’s assertion that the “the application was incomplete” is deliberately misleading. Anyone who has ever dealt with the Department of Immigration knows that they do NOT accept incomplete forms or applications for anything. Anyone who has applied for a passport knows that the first thing a clerk does is check the application for completeness and if it isn’t complete it will not be accepted. The same applies to work permit applications and did apply in this very case. 2. The application for Rev. Tweed’s work permit renewal submitted in July 2016 did have some boxes unchecked and a required signature missing. A very helpful clerk from the Department of Immigration contacted the church to advise of this fact and the required pages were completed and returned via email. The application was then submitted to the Board of Immigration for its consideration. They did in fact consider the application in September 2016. 3. The Minister’s statement is deliberately misleading because in her December 2016 correspondence she makes numerous references to the original 2013 application for a work permit for Rev. Tweed and asserts now in 2017, four years later, that the 2013 application was incomplete. Not only is this irrelevant but it is also untrue. A work permit was approved and issued on the basis of the 2013 application and to revisit it now, four years later is more than strange. 5. In 2016, with Dr. Curtis-Tweed now living and working in Bermuda and having become aware of the Minister’s consistent queries related to his marital status, Rev. Tweed checked the box “Living apart: spouse residing in Bermuda and separated due to marital matters”. It is this “inconsistency” which the Minister cites as the main reason for her refusal of the work permit. 6. It is important to note that the Minister’s initial public position on this application was that she would not interfere and that the application would be allowed to proceed through the normal process. This has not been the case. When the Board considered the application in September, they communicated to the church that in their view the post of pastor of St. Paul should be advertised. Within days of that decision being communicated, the church responded to the Board inviting their reconsideration of the matter on the basis that there is no mechanism within the AME Church to advertise pastorates, receive resumes from applicants, conduct interviews, short list candidates and appoint a successful applicant. The Doctrine and Discipline of the AME Church vests appointments of pastors in the sole discretion of the Presiding Bishop of the relevant District. This is the process in twenty  Districts that span the US, Canada, the UK, the Caribbean and now India. 7. The Board never responded to this communication nor did the Department. The next move was the October 2016 “refusal by the Minister” of the application to renew the work permit. That refusal was predicated on the purported “refusal” of the Church to advertise. That too was and is untrue. As a result, when, after the public outcry, the Minister agreed to reconsider the matter, the application that was before her was one to waive the requirement to advertise the position. It is important to note that this matter was apparently taken from the Board and each decision at every stage has been made by the Minister. It must raise an issue of natural justice for the Minister to hear appeals of her own decisions. 8. What the Minister did not say in her statement of last Thursday is that she has refused the Church’s application and request to waive the requirement to advertise. This is a critically important omission because it has allowed the public narrative to be that the Church has “repeatedly refused” to advertise the position and by implication suggests that the Policy doesn’t contemplate circumstances where that requirement might be waived. The Minister’s suggestion that St. Paul refuses to follow the rules is simply untrue. A waiver was requested. It has been refused. 9. One of the criteria to which the Board and/or the Minister must have regard when considering whether to approve a waiver of the requirement to advertise is where an individual is “uniquely qualified for the position”. St. Paul AME Church is known as “The Cathedral of African Methodism in Bermuda” and has a history of social justice activism from its pulpit and pews. St. Paul is a leading church in Bermuda and its pastor is seen as a community leader as a result. Rev. Tweed is the 33rd pastor of St. Paul and has experience as a Presiding Elder as well as 22+ years pastoring. Additionally, he enjoys the confidence of the Bishop of the District as evidenced by his successive, annual reappointment to the pastorate of St. Paul since 2013. Rev. Tweed is “uniquely qualified for the position”. 10. There are eleven  AME Churches in Bermuda. Ten of the pastors are Bermudian. 11. The other issue which seems to vex the Minister is Rev. Tweed’s name. The issue of his name has been settled for some time and the Department of Immigration has accepted this fact based on a current, valid UK passport in the name of “Nicholas Genevieve-Tweed”. 12. There also needs to be some context around the “late” 2016 application. The background to this is that a general enquiry related to Rev. Tweed’s eligibility for Bermuda status was in train and had been for some time. That enquiry had not reached completion and it was out of an abundance of caution and as advised by the Department of Immigration that the application for a renewal of the work permit was submitted to ensure that time did not run out on the work permit while the concurrent general enquiry remained in train. 13. The Church never expected that this application would be anything more than a standard renewal of a work permit. The suggestion that these events are somehow manufactured by those who would draw some satisfaction from causing strife for the Government is completely false. This was a standard renewal and should have been handled as such. St. Paul simply wants its pastor in place and ministering as he done successfully since 2013. 14. The Hon. Dale D. Butler JP made an interesting point about the Minister recusing herself from considering this matter. It is a valid one because of the circumstances under which Mrs. Gordon-Pamplin left St. Paul and what she has said publicly both in the House and to members of the church regarding her feelings about Rev. Tweed’s ministry. 15. Finally, it is also interesting to note that in light of recent Supreme Court decisions, Rev. Tweed’s marital status would appear to entitle him to assert that he be free from work permit control as the spouse of a Bermudian. He refuses to assert that right in light of his marriage having broken down and the fact of their separation and living apart for over a decade. Rather than assert a right in this regard he stands on principle regarding his private affairs and it seems that this is what has caused his application for a renewal of his work permit to be denied.